Vanessa’s Dumpling House is a family run, New York City institution that has been selling Beijing style dumplings and sesame breads from Elderidge Street in Chinatown since 1999. I gave Vanessa’s a full review back in 2012 and would add to that review that the sesame bread stuffed with roast pork is excellent. Vanessa’s also sells a variety of frozen boiled dumplings; at their Elderidge Street location they sell bags of 50 and at their 14th Street Union Square and Williamsburg, Brooklyn locations they sell bags of 30 and the varieties available differ across these locations. I tried the Vegetable Whole Wheat Dumplings which are available at the 14th Street location. 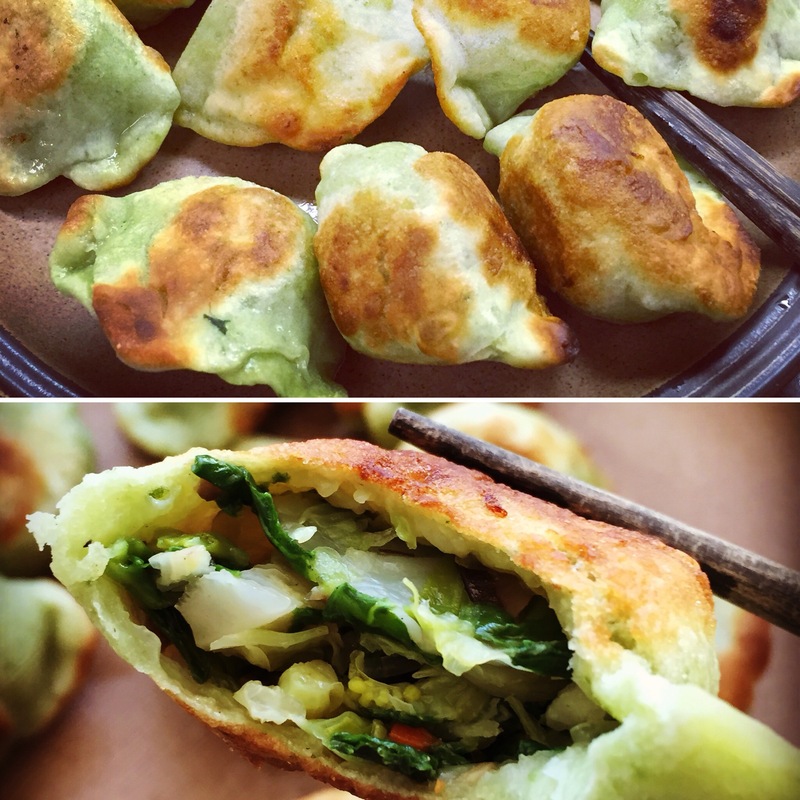 These dumplings are filled with chopped mushrooms, carrots and bok choy and are cloaked in a green colored dough wrappers. After a brief micro-waving the dumplings pan-fried up well and the dough got golden crispy and crunchy. The problem I had with these dumplings was that they were way over-salted and I couldn’t taste any of the vegetables. Vanessa’s vegetable dumplings are vegan. This entry was posted in Boiled, Frozen Dumpling Review, Vegan, Vegetarian. Bookmark the permalink.